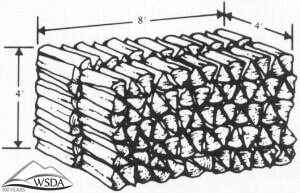 A cord is 128 cubic feet of tightly packed wood measuring 4 feet high by 4 feet wide by 8 foot long. According to the Online Etymology Dictionary etymonline.com, the term was first recorded in the 1610's, so called because it was measured with a cord of wood. Other sources say it originates from bundles of wood being tied with a cord. Source: Washington State Department of Agriculture.